Unbelievable I stuck to a TBR!😅 Sadly Black History Month will soon be over but luckily #readsoullit can continue on. Hope you all had a good one and have discovered some new authors and new books to read throughout the rest of 2018. My #readsoullit stack was pretty good. No duds and I managed to read 7 books. Wish I could have gotten in a 400+ page book so it looks like that will be a priority for next month. Happy continued #readsoullit reading and Thanks to you all for participating! Please check out the video below of Frank X Walker, a great Affrilachian poet from Kentucky. The best works I read this month were from him. Buffalo Dance and When Winter Come are two excellent poetry collections – MUST READS! I had to choose this one especially since I finished it a few days ago. The Mighty Miss Malone is my first Middle Grade read of 2018. Hope it won’t be my last. I can see why its author Christopher Paul Curtis won the Newberry Medal. This was not my first read from Curtis. I read and enjoyed The Watsons Go to Birmingham -1963 a few years ago. Christopher Paul Curtis is an author who writes historical fiction very well for young people. As you know I’m usually not a fan of YA but for some reason Middle Grade just warms my heart. Do you like to read Middle Grade and/or YA if so why and what titles have impressed you the most? Check out the video below of Christopher Paul Curtis talking about his writing and how he got started. It’s inspiring! Day 28 – Favorite Cover I had to put up this beautiful cover of the Middle Grade novel about the Gaither sisters from the series of that name. I first read One Crazy Summer four years ago and loved. It’s the first novel in this trilogy and is followed by P.S. Be Eleven and Gone Crazy in Alabama. This is a great little series for children learning about African-American issues, history, and most of all with relatable characters. I recommend this for children ages 8-12 years old. How could anyone resist that cover?! The person behind the cover is an artist named Frank Morrison. Click his name to find out more about him. Awesome stuff! “Newbery Honor winner and New York Times bestselling author Rita Williams-Garcia tells the story of the Gaither sisters, who are about to learn what it’s like to be fish out of water as they travel from the streets of Brooklyn to the rural South for the summer of a lifetime. These two genres don’t usually attract me at all. I just get a little bored reading them at times so I don’t set out to read them at all. 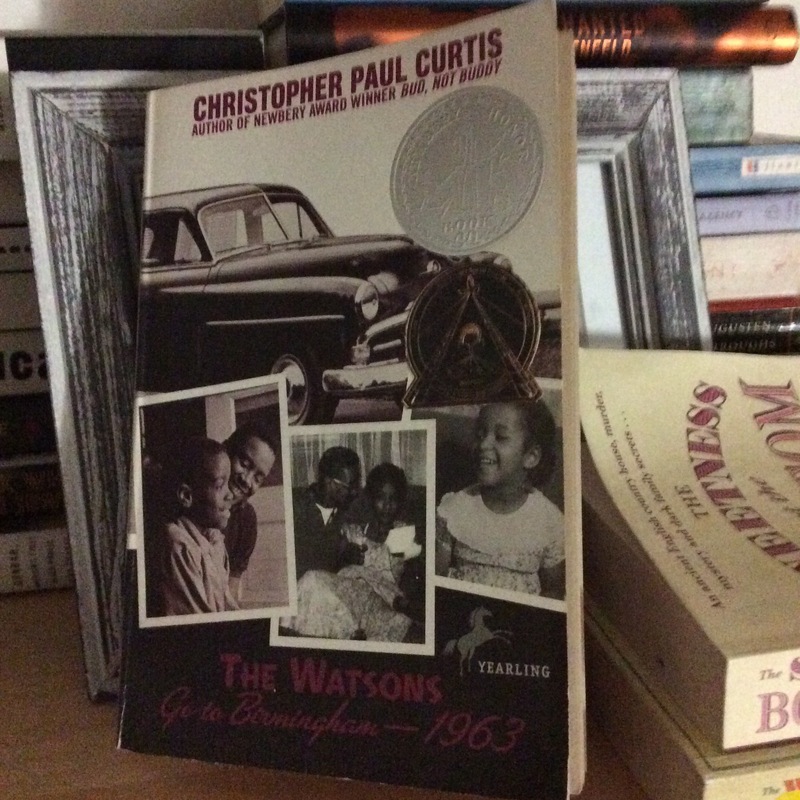 However, The Watsons Go to Birmingham – 1963 is a book I missed. It was published in 1995 so ahem!, so I was older. I was old enough not to have this one on my radar. Photo challenges have this way of getting avid readers like me to dig deep. I found this one on my shelves neglected. It was originally given to me in a bag of used books that someone wanted to discard. I love discarded books because I always seem to find treasures inside of them. This book won a 1996 Newberry Honor and a Coretta Scott King Honor Book Award. Christopher Paul Curtis has written many other middle-grade/Young Adult awarded novels, like Bud, not Buddy, Elijah of Buxton, The Mighty Miss Malone, among others.